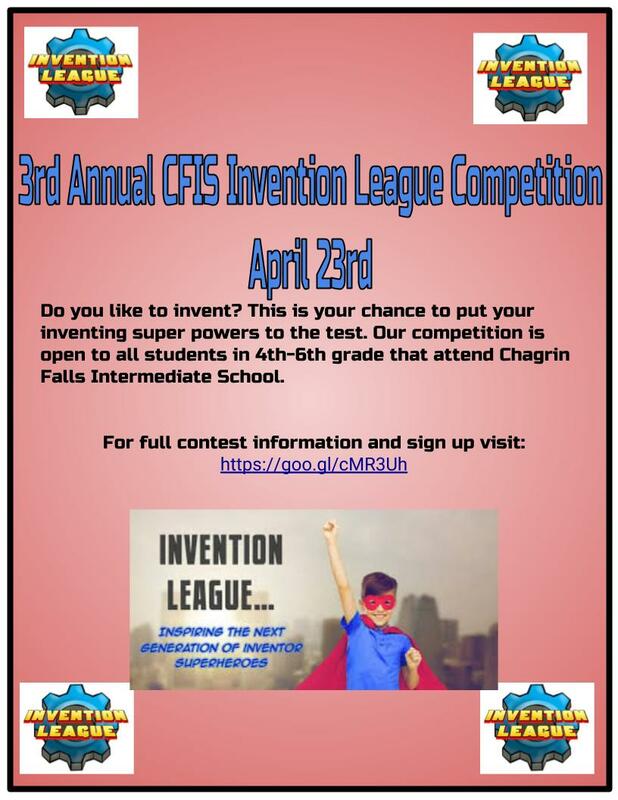 The 3rd annual CFIS Invention League Competition will be held on April 23, 2019. This is a chance for any CFIS student in grades 4-6 to give their inventing super powers a test. CLICK HERE for the informational flyer. CURRENT 4th and 5th Grade Parents: ANY child interested in auditioning for the select choir must have the permission form filled out by a parent. Please refer to the packet that was sent home or you can access the Select Choir Audition information below. Fourth and Fifth grade students at CFIS are welcome to audition for the 2019-2020 CFIS Select Choir. Please CLICK HERE for all of the information, permission form and the audition recording. CFIS Fourth Grade students and parents are invited to attend a Music Course Selection Night on Thursday, May 9, from 4:30 - 6:30 in the Middle School Cafeteria. Students and parents will meet the teachers and students will have the opportunity to try out the Band and Orchestra intstuments and learn about Choir and General Music for next year. Please CLICK HERE for complete information. CURRENT 4th Grade Parents: Please fill out this link for your child's encore music course selection for the 2019-2020 school year. Please refer to the packet that was sent home. Please fill out by MAY 17. THIS LINK WILL BE AVAILABLE THURSDAY, MAY 9TH. CURRENT 5th Grade Parents: Please fill out this link for your child's encore music course selection for the 2019-2020 school year. Refer to the packet that was sent home. Please fill out by MAY 17th. 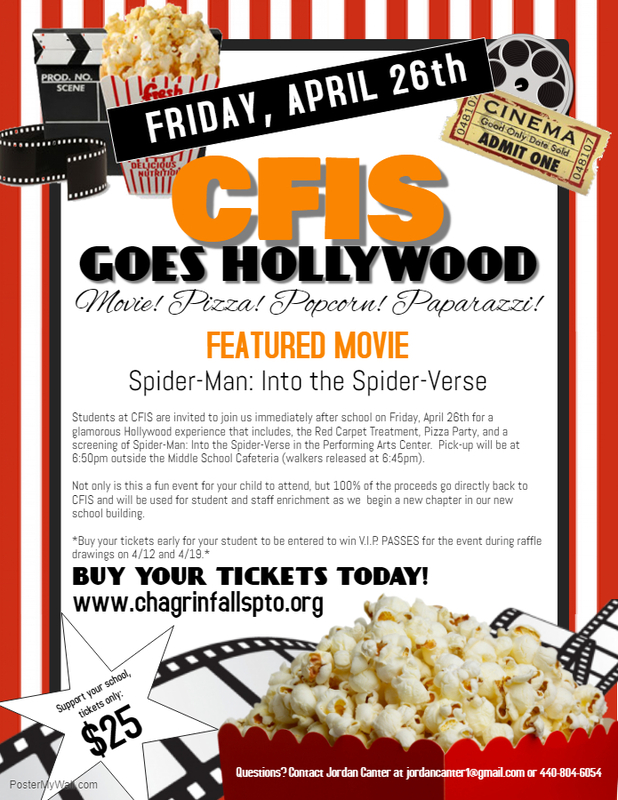 Tickets for our school's FUNdraiser, "CFIS GOES TO HOLLYWOOD", are on sale now! during raffle drawings on 4/12 and 4/19. CLICK HERE to register. This year the Chagrin Falls Music and Art Departments will hold a Fine Arts Festival celebrating the visual and performing arts in our district on Friday, May 10th and Saturday, May 11th, 2019. This is a brand new event and serves as students' required spring performance instead of weeknight concerts. 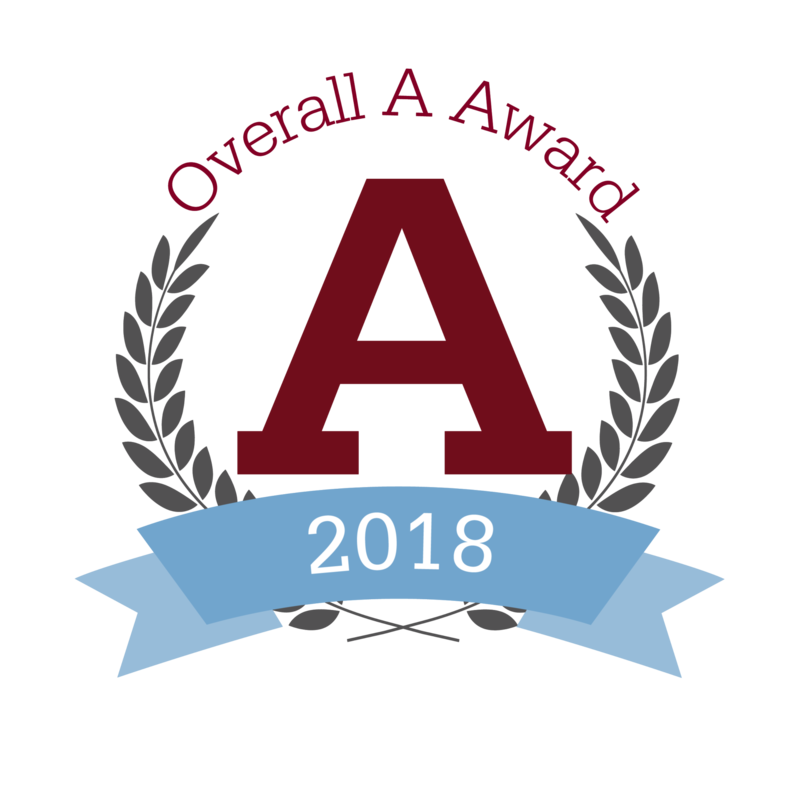 Please CLICK HERE to find the schedule of events, the music report times, attire, and a student - parent acknowledgement form. 6th grade overnight Retreat is approaching. There is a parent meeting on April 24th at 6:00 PM in the Middle School gym. Information packets and permission forms were sent home last Wednesday. Please review the packet and return the permission slip with payment at your earliest convenience. If you are interested in being a volunteer, please contact Mr. Volk or Mrs. McKelvey. CLICK HERE for the Retreat drop off/pick up procedure. Hey 6th graders! Share your awesome talents with the whole school by CLICKING HERE to register your act and to obtain some important details about this show! Chagrin Falls schools, along with community members, will be rolling out a Community Recycling Initiative to bring awareness, facts, and the impact of plastic in the environment. CFIS students will participate in Project Shop Smart Cha-Green letter-writing contest. CLICK HERE for all of the information related to the Intermediate School writing contest. The purpose of vision and hearing screening is to aid in the detection of school-age children who have or at risk for developing vision/hearing disorders. These screenings are required by the Ohio Department of Health on an annual basis. Please CLICK HERE for all of the information regarding the screening. State Law requires, with limited exceptions, regular attendance of all students. We are required by law to notify parents/guardians in writing when a student is not in compliance with State Law. Please CLICK HERE to review the CFIS handbook attendance quidelines. Safe Routes Chagrin is looking for crossing guard volunteers. Please CLICK HERE for infomation regarding shift times and training. To report an absence, please click on the grade level of your child (see boxes below). All absences should be reported by 9:00 AM. Transportation changes must be made by 2:00 pm and called into the main office at 440-893-7690. No transportation changes will be accepted after 2:00 pm unless it is an emergency. Please contact the office for any transportation changes during the day. Please CLICK HERE to review the CFIS attendance guidelines.